Chichén Itzá is one of the most important archaeological sites in Mexico, and many travelers like to visit the site as a day trip from Cancún. This amazing Mayan site is located in the state of Yucatan, about 120 miles west of Cancún in the state of Quintana Roo. The time it takes to get there depends on the method of travel you choose. Each option has advantages and disadvantages, the best one for you will depend on your budget and how important it is to you to have a say in the timing of your visit. 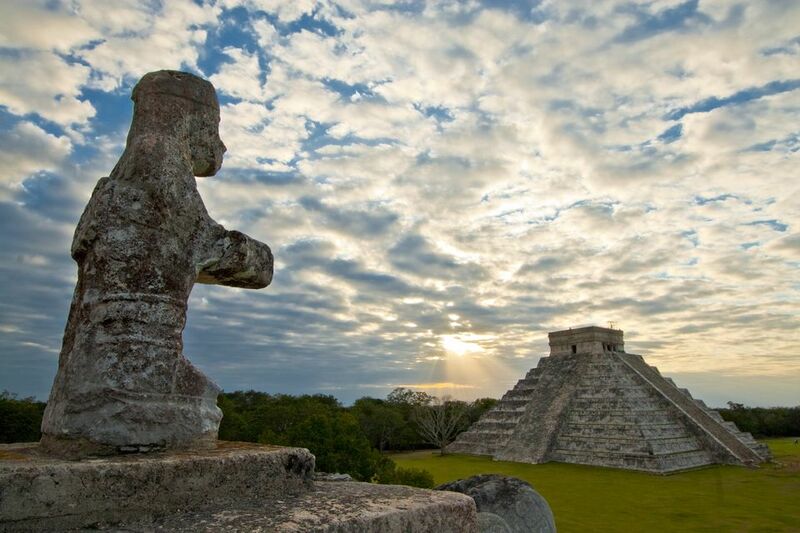 Here are the five best ways to get from Cancun to Chichen Itzá. Driving in the Yucatan Peninsula is fairly easy in comparison to some other places in Mexico, so renting a car can be a good option for independent travelers. The highway from Cancún to Chichén Itzá is quite flat and straight, it's in decent shape, and has good signage, and the drive typically takes about two hours. The advantage to this option is that you can make your own schedule and decide when and where to stop. Once at the site, if you like, you can hire a licensed guide to take you around and explain the history and background of the site and the Mayan civilization. Guides are available for hire at the entrance where you purchase admission tickets for a fixed price. When looking for a car rental, keep in mind that the price quoted usually doesn't include insurance and the inclusion of this in the fee will raise the cost considerably. The easiest way to get to Chichén Itzá from Cancún is by joining an organized group tour. You can easily book one of these tours online before your trip or at your hotel once you've arrived. A van or bus will pick you up at your hotel in the morning, and you'll travel the distance to Chichén Itzá along with your group and have a guided tour of the site. Most tours include a visit to a nearby cenote for a quick dip either before or after visiting the archaeological site, as well as a buffet lunch somewhere along the way. This is an easy and convenient way to get to Chichén Itzá, but you may be squeezed into a vehicle at its maximum capacity for the hours long drive, which may be made longer as the vehicle goes around to various hotels to pick up people in the morning and drop them off at the end of the day. You'll also arrive at the archaeological site at the time when it's most crowded. Another option is to hire a private guide or driver to take you to Chichén Itzá. This is more costly than a group tour, but will allow you to set your own timetable and cut out the wait times involved with group travel. You can arrange for an early departure time to arrive at the archaeological site before the crowds, travel more comfortably, and visit other spots as you desire. If you get a good guide, he or she should provide information and background during transit times as well as giving you a tour of the site. Check Tripadvisor for recommendations for private guides. Independent travelers on a budget may prefer to get to Chichén Itzá by bus. The ADO bus company offers service from the ADO station in downtown Cancún to Chichén Itzá daily at 8:45 a.m. with a return bus departing at 4:30 p.m. from the archaeological site. According to the ADO website, the journey takes a little more than three hours. If those times don't work for you, another option is to first take the bus to the town of Valladolid, since there are many more departures throughout the day, and get another bus from there to Chichén Itzá. Bus tickets are available for purchase online through the ADO website, or in person at any ADO bus station in Mexico. Want to see amazing aerial views of Chichén Itzá and the surroundings as well as avoid long driving times? Possibly the most glamorous way to get to Chichén Itzá from Cancún is to fly. There's a small airport near Chichén Itzá and a few companies offer transportation by plane or helicopter. The flight takes a little under an hour each way, and you'll get to enjoy amazing views as you go. Fly Tours Cancun has a fleet of three small airplanes and offers private and shared flights to Chichén Itza and a few other locations in the region. Cancun Helicopter offers a similar service with transportation in a Bell 206 helicopter.